She is currently completing a second book called The African Novel of Ideas: Intellection in the Age of Global Writing, under contract with Princeton University Press. It tells the story of the often-fraught relationship between the novel and philosophy at key, under-studied junctures of African intellectual life, from the early 20th century through the present day. It is a story, specifically, of how the novel negotiates between liberal selfhood and social awareness of various liberal orders’ failings, unseating false dichotomies between humanistic and liberationist modes of reading and writing. Starting with Fante anticolonial statesmanship in pre-nationalist Ghana; moving through Stanlake Samkange’s efforts to systematize African philosophy in mid-century Zimbabwe; charting more recent eastern African experiments with incorporating indigenous belief systems into narrative through the figure of the outcast; and arriving, finally, at narrativizations of “philosophical suicide” by current southern African writers, it offers a far-reaching account of the relationship between reflective solitude and aggregative structures. 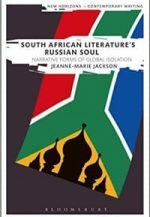 Jackson has work published or forthcoming in NOVEL; Research in African Literatures; JNT: Journal of Narrative Theory; Comparative Literature Studies; Safundi; The Cambridge Journal of Postcolonial Literary Inquiry; Studies in the Novel; and English Studies in Africa. She also writes for venues including Public Books; n+1; The Conversation; 3:AM Magazine; Bookslut; Africa in Words; and The Literary Review. “Going to the Dogs: Enduring Isolation in Marlene van Niekerk’s Triomf.” Studies in the Novel43.3 (2011): 343-362.